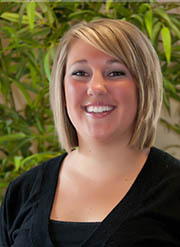 Lindsey started at Studio Salon of Bonney Lake in September of 2009. She got her cosmetolegy license through the Gene Juarez Academy where she also went through their instructor training program and became an instrucuctor specializing in haircutting and design. Lindsey was an instructor there for 2 years. The thing Lindsey loves most about hair color and design is making people feel good about themselves with a new style!